Note: This article is currently in development. Detailed information regarding Talk will be available soon. 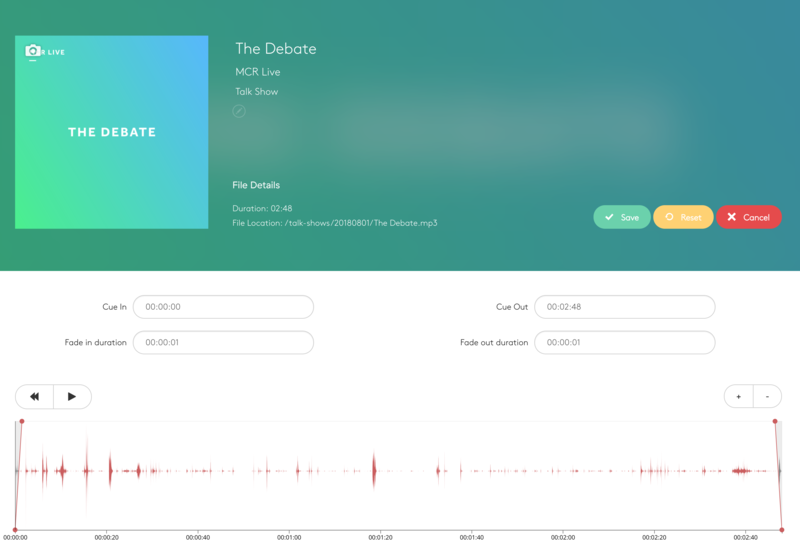 Radio.co Talk is a new way to create a collaborative talk show directly within your Dashboard. Simply create a show and share your link to participants. 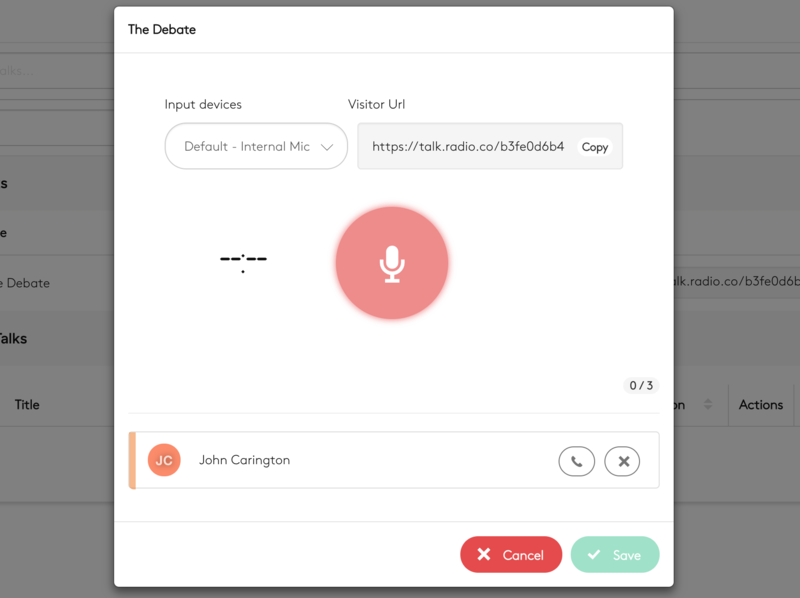 Once everyone has joined you can brief them directly in Radio.co, then record your show when ready. 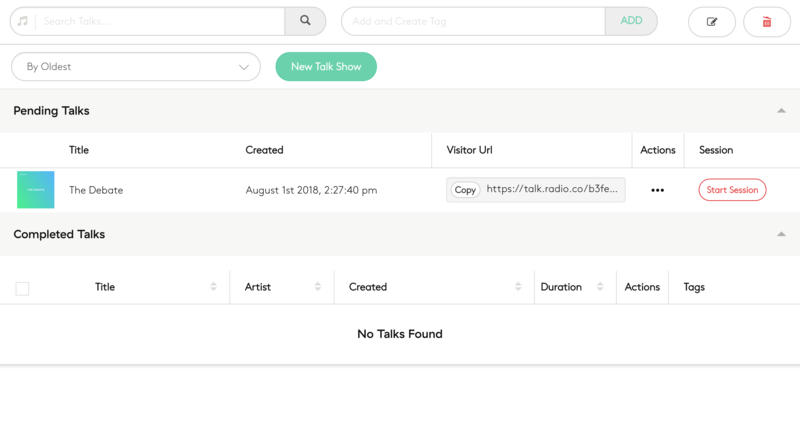 Completed talks will be available in your media library for future scheduling on your station. Your station must be on the Gold or higher plan. You can upgrade by heading to Settings > Billing > Change Plan in your dashboard. If your station has collaborators, anyone with Music Controller or above roles will be able to use the Talk feature. Head to Media > Talk Shows (Beta) in your Dashboard Sidebar. Next Click the green 'New Talk Show' button at the top of the page. You can create a Talk Show (what you will use to invite guests and record your show) by pressing New Talk Show. 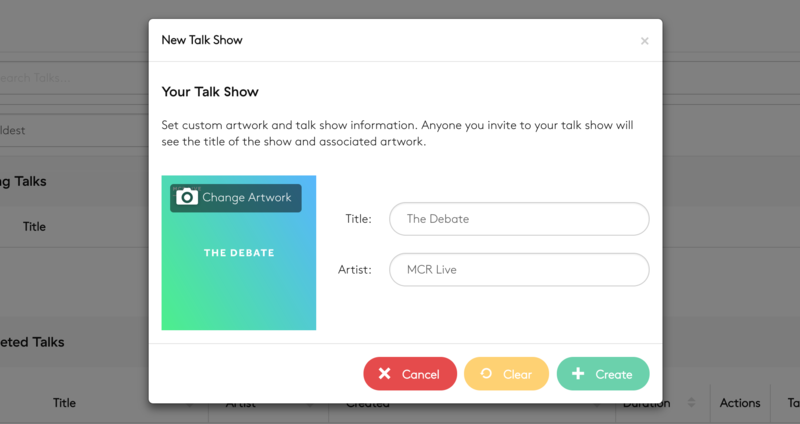 In the popup you can add artwork to your show, a title and artist. This will be used as the show's track information once complete. If you wish to change this after recording the show you can do so via the Recordings Editor explained later in this help guide. To invite guests you can share the Visitor URL with them via your preferred method (e.g Email, Google Calendar invite, Whatsapp etc) along with the time and date of your talk show. When a guest calls, you can answer by clicking the Phone button on the right side. Note: When answering, new guests will be muted by default. Click the Mute/Unmute button to hear them. 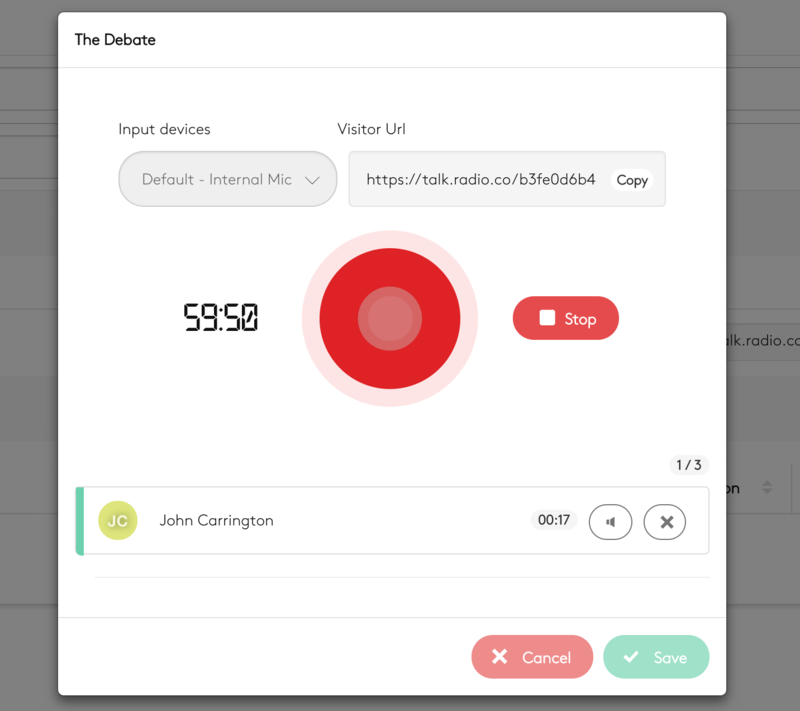 You can mute/unmute callers at any time during your recording, this is useful if you only want to discuss topics with one particular person in a segment of your show. Once your guests are connected you can begin recording. Click the 'Record' button. Your show can be a maximum of 1 hour long. This is displayed on the countdown timer. When you have finished recording your show, click the Stop button. You can then play a preview back. Your callers will still be connected at this point so you can give them any further information or bid them farewell. Once you are happy with your recording, click the green Save button. Here you can click the Actions (...) button to access the Talk Editor, or download the recording for future use. As your Talk Shows are added to your Media Library, you can insert them into playlists just like any other track.